Welcome to our first project pattern for the masses. 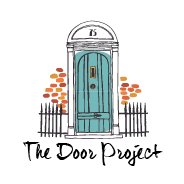 The Door Project was conceived out of years of travel, combined with years of walking in and out of the doors of life. I'm finding that one of the values important to me to instill in my children is variety. I want them to taste different foods. Talk with different people. See different landscapes. I want them to know that it's a wide, wide world full of potential and adventure and differences. We love to travel at our house, and not just for wanderlust's sake, although some trips are just for that. When you take a trip, you enter into someone else's reality. You have shared experiences in that new place, no matter how far from or close to home you go, and then you get to return to your own life a changed person. It's fun to think that right now someone is being a mom in France, or Egypt, or California. How is she doing it? What is the view out her door today, emotionally and physically? And then as the months and years go forward from that trip, the trip itself takes on legendary status. It becomes romanticized in our memories and valued in future days that aren't as exotic or easy. Life takes us through all kinds of doors. School doors. Minimum wage job doors. First home doors. Vacation doors. The doors of hospitals and funeral homes. All of these doors make up who we are. They are the sum total of the path we have taken. This is what The Door Project is all about. All three of us have passed through our own doors, and love to share where we've been and what we see coming. There is something beautiful about the symbolism of a door. It's a way to a new place, a change of view, opportunity. An escape from something we are done with. It's also a great idea for a quilt pattern. Join us in making your own door project out of fabric. This first pattern book will have twenty-six doors in four different sizes. The creative possibilities are yours to explore. Enter this new door with us and have fun traveling the world from your own sewing machine.